Like almost everyone else I am a member of Facebook and recently I started posting on Twitter as a way to drive interest and views to this blog. I post on LinkedIn. Yes, I am engaging in social media and I am using it to promote myself and my business. As an entrepreneur with a small consulting practice this works for me. However, after reading the article below (that was posted on my Facebook page because I “Like” another business) I realized that there is something missing in the conversation. The reality is, for businesses that are trying to reach consumers and not other businesses, social media should go way beyond Facebook and Twitter. Most businesses still don’t understand how to use social media and they equate it with just being on Facebook and Twitter. Having a good Facebook and Twitter strategy should come after they develop a strong social media strategy. Social media is not a strategy, but a serious of tools. You need a cohesive strategy of how social media fits into your marketing plan and how you are going to use it to drive your business. To engage consumers, speak to and with them and turn them into advocates you need a complete strategy that takes into account the multiple layers of social media and not just Twitter and Facebook. Establish an Integrated Marketing Plan: A solid marketing plan and a great promotional idea will incorporate as many marketing vehicles and tools as your budget can afford and will achieve your goals. This will include a digital strategy, social media, retail, PR, promotion, etc. Even if we are focusing on the digital and social media strategy here, we need to have ways of driving our consumers to where the messages and conversations are. We need to surround them with the message in all the places they consume media. You can’t go on the assumption of “if you build it, they will come.” Make sure that your social media campaign is properly incorporated into your broader plan. Use Bloggers to Promote Your Brand: Influential bloggers are an added resource to drive a conversation and create awareness for the brand or company. They can highlight new products, new uses and promote a positive image for your brand. They are often the ones to develop the viral campaigns that brands love. It takes a bit of research to contact the right bloggers and often a bit of effort to recruit them to your cause. However, once you do, it can go a long way to broaden your social media message. Remember, you are not looking to “pay for play” with the bloggers, but an unpaid endorsement. One way is to offer product samples and information about your product. Believe it or not, these bloggers are often looking for new content or a way to engage their readers (i.e. sample giveaway). For service products, it can still work as you provide information and special offers to the consumers vs. a sample. Don’t Forget Your Own Brand’s Website: Social media can start at home. Create a blog on your brand’s website. You can post white papers or other information about product usage. You can ask for opinions from your users. You can create a dialogue with your customers in an environment where they will also be surrounded by your brand message. Consider Mobile: One could say that mobile marketing is a different set of vehicles from the social media applications of Facebook and Twitter. However, nothing is more social than your phone. Use phone apps, texting, etc. 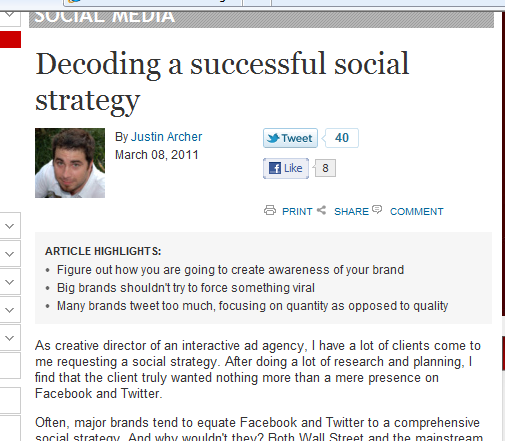 to drive engagement and viral activity. It can then link back to your website or Facebook pages. Don’t Limit Yourself: OK, no one can beat Facebook for sheer number of members, but make sure that your target audience isn’t engaging on other social media sites that you are may be ignoring. Explore where else can you start or participate in a conversation where your specific target audience is sharing information. Once upon a time it was all about MySpace before Facebook become the big idea. Facebook and Twitter are great tools when used properly. The important thing is to make sure that as a marketer you think beyond them and develop a social media strategy that is best for your brand.